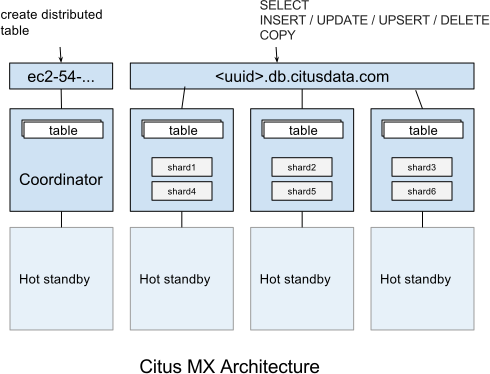 Citus MX is a new version of Citus that adds the ability to use hash-distributed tables from any node in a Citus cluster, which allows you to scale out your query throughput by opening many connections across all the nodes. This is particularly useful for performing small reads and writes at a very high rate in a way that scales horizontally. 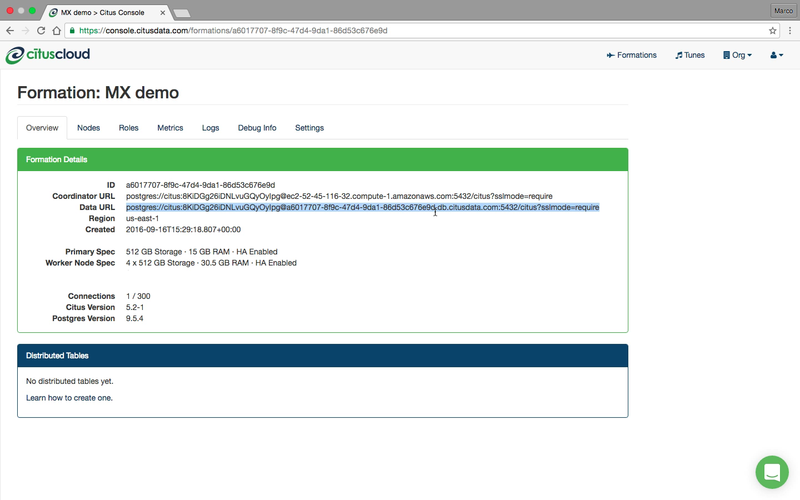 Citus MX is currently available in private beta on Citus Cloud. If you connect to the data URL using psql and run \d , then you will see all the distributed tables and some of the shards. Importantly, distributed tables are the same from all nodes, so it does not matter to which node you are routed when using the data URL when querying distributed tables. When performing a query on a distributed table, the right shard is determined based on the filter conditions and the query is forwarded to the node that stores the shard. If a query spans all the shards, it is parallelised across all the nodes. Append-distributed tables currently cannot be made available from workers. They can still be used in the traditional way, with queries going through the coordinator. However, append-distributed tables already allowed you to Bulk Copy (250K - 2M/s). When performing writes on a hash-distributed table with a bigserial column via the data URL, sequence numbers are no longer monotonic, but instead have the form <16-bit unique node ID><48-bit local sequence number> to ensure uniqueness. The coordinator node always has node ID 0, meaning it will generate sequence numbers as normal. Serial types smaller than bigserial cannot be used in distributed tables.